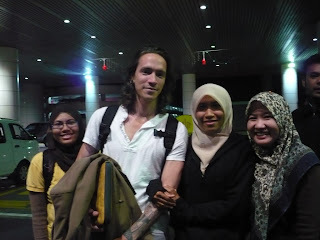 So I messaged Crazy Mary since I saw on the board that she's planning to meet & greet Incubus on Friday. She said yes! 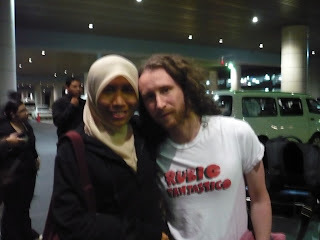 So fast forward to Friday 14 Mar, we are waiting at KLIA for Incubus to arrive from Shanghai at 9.40 pm (some hardworking fan did the research). We are actually not very sure whether this was the correct flight. Anyway, we waited for an hour until they finally arrived! I clicked my camera on Brandon, the flash went out, he noticed, looked at my direction & smiled ! Hope her children are no longer angry at her for spending that much of her life savings. The results are in. Tok Mun lost to the BN candidate who won with more than 30,000 votes. Tok Mun only garnered 685 votes. This means she has forfeited the deposit amount of RM 10,000 to contest for a parliament seat as she got less than 1/3 of the vote required to get her deposit back. 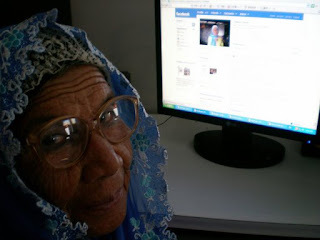 Her bank account no will be posted at her blog http://maimunbintiyusuf.blogspot.com/ later. Please check her blog from time to time. 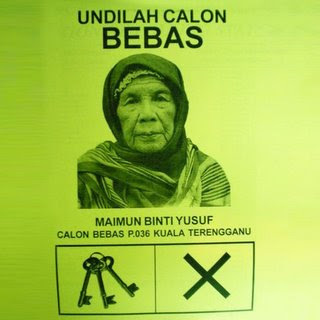 She would definitely get my (mental) vote ( I'm voting at a different area) for her courage & determination, being rejected by SPR for 4 times before this...she said she had to wait for 20 years for this!